Audiences are gearing up for Lin-Manuel Miranda's return to the title role in his award-winning hit musical Hamilton. As previously announced, the show's creator and original star will reprise his turn from January 8-27, 2019 at University of Puerto Rico's Teatro UPR to help support the Flamboyan Arts Fund. 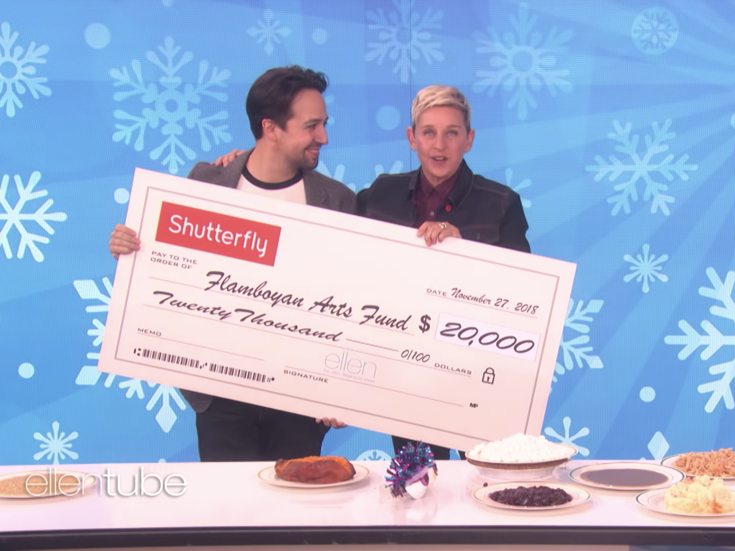 "We're raising money for artists and arts organizations in Puerto Rico," Miranda told Ellen Degeneres on the November 27 episode of her talk show. To celebrate his upcoming Hamilton run and to toast the end of Thanksgiving, Miranda and Ellen teamed up for a perfect leftovers edition of her delightful game "Taste Buds." Watch Miranda below—donning a T-shirt expressing his love for Tony-nommed Hamilton original Christopher Jackson—and make plans now to see the hit show in Puerto Rico, on Broadway or on tour.